Swimming is a vital lifesaving skill that can be learned at a very young age, and can be enjoyed for a lifetime. We offer lessons seven days-a-week so that you can schedule a regular lesson time that will fit your busy schedule. We believe in safety first, and our progression is designed to produce safe, calm, and confident swimmers who love the water. Helpful office staff, flexible scheduling, and generous make-up policies will make your time at Daland both enjoyable and productive for you and your children. In our experience, once per week swimming year ‘round, allows the student to not only maintain, but also improve their safe swimming skills. Enroll in a second spot for twice per week lessons and receive a 20% discount and even faster progress! Our #1 priority is water safety! 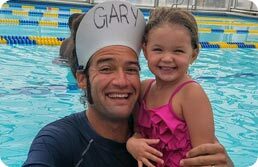 With safety as our number one priority, we start all non-swimmers in private lessons. This one-on-one ratio enables the instructor to quickly establish a bond with the student and a relationship of mutual trust to foster learning. We focus on buoyancy and balance in the water to create a strong foundation for all swimming skills. With twice a week lessons, your child will become a safer swimmer much faster. Once a swimmer is able to swim 25 feet independently, we encourage group lessons. With two swimmers per instructor, semi- private lessons are perfect for siblings or friends around the same age and ability. Students continue to perfect their swimming skills, gain confidence, and learn from one another in a safe and fun environment. Students in semi-private lessons should be comfortable to swim across the pool independently. Swimming is a vital lifesaving skill that can be learned at any age, and can be enjoyed for a lifetime. Take the first step, plunge in and learn the stroke skills get in shape or gain the confidence in the water help keep your kids safe in the water. When you enroll, you receive a free lap swim membership so you can practice and reinforce the skills you learn in your lesson. With only 3 - 4 swimmers in a class, our small group lessons students continue to perfect their swimming skills, gain confidence, and learn from one another in a safe and fun environment. Students continue to master basic safe swimming skills while also learning freestyle and backstroke. Students continue to master basic safe swimming skills, freestyle and backstroke, and begin butterfly and the racing dive. Students continue to master basic safe swimming skills, freestyle, backstroke, butterfly and the racing dive, and begin breaststroke. Students continue to master basic safe swimming skills, freestyle, backstroke, butterfly, breaststroke and the racing dive, and begin to focus on competitive turns and endurance.